Our house is the perfect place to get away, escape your busy life, unwind and chill out in a peaceful location. Wake up in the morning, enjoy the sea and pool views and start your day with breakfast on the balcony. Escape the pressures of every daily life, catch up on a good book and spend quality time with friends and family. Enjoy delicious meals cooked at home, a tasty BBQ on the roof terrace or dine out in one of many attractive restaurants in this part of Turkey. This is also an ideal base to be able to discover the beautiful Bodrum Peninsula by dolmus bus or car. There are some lovely towns, villages and beaches to visit during your vacation. Our house is a good choice for couples or families seeking a quiet location to combine rest and relaxation, fun by the pool or beach, as well as fantastic days out. Check out the location section for ideas of things to do when staying here. There are historical places of interest, activities and excursions on offer. WHERE IS LITTLE VALLEY (KUCUK VADI SITESI) LOCATED? Our house is on a small complex of only 14 houses. It is at Koyunbaba Bay, very close to the pretty fishing village of Gumusluk. It only takes 5 minutes to drive by car to Gumusluk. The dolmus bus stop is close to our house if you do not have a car. Within walking distance is the Migros supermarket, bakery, The Terrace Bar and Restaurant, Doga cafe, bus stop and taxi rank. It is less than 10 minutes walk down to the nearest beach. Walk along by the sea to reach Amphora beach bar and restaurant and Kucuk Ev cafe. Take time to explore Yalikavak, Turgutreis and Bodrum which all have fantastic markets, restaurants and marinas. Enjoy a visit to Bitez, Ortakent, Gundogan and Golturkbuku. There are lots of beaches on the Bodrum Peninsula to enjoy throughout your stay. Therefore you can have a very varied holiday whilst staying here as do as much or as little as you want to. Our house has 3 bedrooms plus a sofa bed in the lounge (maximum occupancy of 5 adults + 1 child). The open plan lounge/ dining room is spacious with 2 sofas, coffee table, a large 42 inch flat screen TV, DVD player with English DVDs, basic satellite TV system (showing some English, Turkish and European programmes), I-Pod docking system and Playstation 3 and 2 systems with games. Wi-fi internet is available. We also have an English book library, some board games, cards and kids books. There are beach toys such as buckets and spades to use during your stay. The inside dining table seats 6 people and has great views of the pool and the sea. A cold water dispenser machine is also available for chilled drinks. The lounge and dining room also has air-conditioning unit, a floor standing electric fan and ceiling fans to help to make the villa nice & cool during the summer. In the newly installed kitchen, there is a 4 ring gas BOSCH hob, full electric BOSCH oven with grill, large BOSCH fridge freezer, fully integrated BOSCH dishwasher, microwave, large sink, kettle, toaster, pans, plates, dishes, cups, glasses, cutlery. There is access to the balcony for outside dining with table and chairs. The master bedroom has views of the swimming pool. It features a king size bed, large wardrobe, bedside tables and drawers. The twin bedrooms features 2 single beds, large wardrobe and a bedside table. The 3rd bedroom has a double bed, bedside tables and a clothes hanging unit, as well as access to the patio. There is also the option of using the double sofa bed in the lounge. Each bedroom is installed with air conditioning and a plug-in electric fan. The family bathroom is located on the ground floor, close to all of the bedrooms and has a toilet, wash basin, shower and washing machine. The living and dining area, as well as the kitchen are on the first floor. An internal stairway from the first floor leads up to the roof terrace. A small, second WC is located inside, next to the roof terrace. We have installed mosquito screens on the windows so you can leave your windows open when at home to benefit from any sea breeze. There are 2 communal swimming pools which are shared between just 14 houses. Just a few steps away from our house, these are perfect for cooling off, swimming or just for having fun with the family. The smaller pool has Roman styled steps and a shallow end, so is good for younger children or non-swimmers. The 2nd pool is larger and deeper, which is great for swimming laps. Our house has a variety of outside spaces to enjoy. There is a ground floor patio which leads out to the larger pool. The 1st floor balcony leads out from the kitchen so is perfect for dining outside. The roof terrace is a great outdoor space, perfect for sunbathing. From here, there are wonderful views of the large swimming pool and the sea. It is wonderful to sit out on the roof terrace and enjoy a drink in the evening as the sun goes down. We have provided outdoor furniture such as sun loungers, a sun parasol, tables and chairs so you can relax and enjoy the outdoors lifestyle. Dine outside on the balcony, enjoy a morning coffee on the patio or cook a BBQ on the roof terrace in the evening. About 5 minutes walk from the house is a large Migros supermarket. Here you can purchase all the groceries that you will need for your stay. There is a large fruit and vegetable section, chilled and frozen foods, fresh bread, dried products such as cereals, tins & packets. You can also buy alcoholic/ non-alcoholic drinks as well as all toiletries, cleaning products and outdoor inflatables for the pool. The local markets are great to visit to buy fresh food. There is also an ATM cash machine, dolmus (bus) stop, water shop and a fantastic bakery shop serving delicious fresh bread, rolls and pastries. Replacement bottles for the water cooler can be purchased cheaply from our caretaker who lives on-site. The Terrace Bar and Restaurant and Doga cafe are close by so it is easy to dine out locally. The local beach is less than a 10 minutes walk down the road at the side of the complex and there is another beach, cafe and play park (Bolme Beach) within a 20-25 minutes walk. Before your holiday, you will receive a travel pack with information including directions from the airport, collection of villa keys etc. A guest manual is provided at the house with ideas of where to go out, where to shop, where to eat, local maps & excursions. Fly into Bodrum Milas airport with Easyjet or Jet.2. Other airlines include Turkish Airlines, Thomas Cook, Thomson. 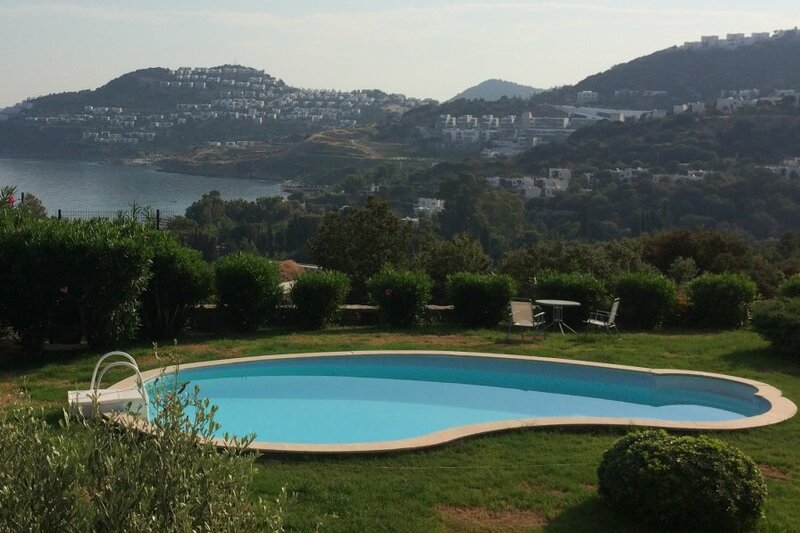 Bodrum Milas airport is just under 60 minutes drive to the house. Some of our Turkish or Eastern European guests choose to drive directly to the property in their own car. Car hire is not essential as we have had guests who do not hire a car and choose to get around on the local bus service (dolmus) which is really easy and cheap to use. We can help with arrangements for airport transfers. However if you decide that you do want to rent a car to fully explore the region, then we work with a local car hire company who are reliable and have good rental rates. Please ask for a quotation. The local transport bus service in Turkey is called the dolmus and runs along the road near to the villa. There's lots of taxis in the nearby towns & villages if coming home late. You can travel to Gumusluk easily on the dolmus bus then change here to continue onto Turgutreis & Bodrum. In the other direction from our house, you can travel into Yalikavak. If you are a family looking for a fun day out, take a visit to the Pirates of the Cactus water park in Yalikavak or there is the larger water park at Bodrum. From Yalikavak, you can catch a dolmus to visit other towns on the Peninsula such as Gundogan and Golturkbuku. Standard arrival time from 4pm onwards, departure time 10am however we may be able to be more flexible (subject to existing bookings). Rental rates include all reasonable usage of gas, electric, bed linen and bathroom towels. Wi-if internet is provided for website browsing and emails only. We will top up the internet once free of charge during your stay, at your request. If you choose to stream TV or downloads via the internet, this will use the data very quickly and it is likely that you will have to pay to top it up. It is mandatory that you have your own personal travel insurance for all members of the travelling party which incorporates the duration of your stay. We cannot accept personal claims. The security deposit will be refunded after your holiday, via the clickstay system once the property has been checked. Once your booking is confirmed, the price is fixed and will not change. We reserve the right to change the published prices for new bookers during the holiday season depending on availability.